Please show your support for the Fallen Buffalo Firefighters and buy a t-shirt. First Impressions Apparel Inc, along with the Buffalo Professional Firefighters Association will be donating all profits from the sale of the Benefit T-Shirt to the Families of Fallen Hero Firefighters: Chip McCarthy & Jonathan Croom. The New Orleans Fire Department employs full-time firefighters that work a 24 hour on and 48 hour off schedule. The department uses a common practice in the fire service of testing all applicants and ranking them based on their results. The test is conducted by the Civil Service and is only given on Saturdays on certain dates. Apply in person at the Civil Service application desk located at 1300 Perdido Street in Room 7W03. Please remember, application are only accepted during open recruitment periods. Submit to a background check. This usually is conducted by the police department or another agency. All applicants must successfully complete a written exam. The department requires a physical agility test. Train for this step in the hiring process by getting into great physical condition. There are many books and web sites that offer great training tips to make sure you can pass the test safely, in the required time. Pass a medical exam and drug screening. This is an important step in the process. Fire Recruits attend a training academy that is 16 weeks long and is completely paid by the city. Once a recruit completes the academy they serve one year as a probationary firefighter. You must have a certified copy of your Birth Certificate, a valid driver's license, and an original copy of your high school diploma or GED. The Los Angeles Fire Department (LAFD) has a long standing for an exceptionally high standard for training and performance. The Los Angeles Fire Department is responsible for protecting approximately 4 million people who not only live in America's second largest City, but also work and play. Joining the ranks of LAFD is no easy task and should not be taken lightly. Below are the basic steps to help you join the LAFD's 3,562 uniformed personnel. The LAFD is an action packed department to work for. Last year the department responded to 713,762 calls for help. Minimum age of 18 years at the time of application. Minimum A U.S. high school diploma or G.E.D. equivalent, or a California High School Proficiency Examination (CHSPE) certificate. A valid California Driver's License. Find out when the LAFD will be offering an Orientation Seminar. The seminars are usually offered the 1st, 2nd, and 3rd Saturday of the month from 8:00 a.m. to 10:00 a.m and from 10:00 a.m. to 12:00 p.m. You need an appointment to attend, so contact the Recruitment section at (213) 485-8032. All candidates must complete a Preliminary Background Application as part of the application process at the time of filing. To become a Los Angeles Firefighter you need to successfully complete the Candidate Physical Ability Test (CPAT). To state “successfully complete” is an understatement! You need to score in the top 10 of all testers! The LAFD offers CPAT practice sessions, so take full advantage of that! Just remember, a Firefighter is one of the most physically demanding jobs in the United States. Click here for a video of the CPAT course. Score highly in a written multiple-choice test. The test contains math and reading comprehension. An interview is required. Only the candidates with the highest score will continue in the selection process. Complete background investigation will be conducted. Initial review of qualifications by a LAFD panel. A field investigation is conducted to evaluate the candidate. Final panel review which includes a possible conditional job offer. Pass a medical exam and you must be a nonsmoker throughout your career with the Los Angeles City Fire Department. Firefighter fitness is not something new in the fire service. Just look at large departments like NYFD and LAFD to see how fitness is an important part of a firefighter’s lifestyle. 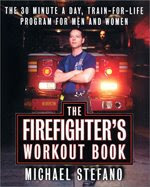 Captain Michael Stefano of the NYFD has put together an impressive workout book that has helped recruits successfully score high in the CPAT. Every potential firefighter should start training while before an application is submitted and contain that training for the greater part of their life. The CPAT must be successfully completed in less than 10 minutes. However, the faster times usually place an applicant higher on the selection list. Once you have earned the badge and are part of the Brotherhood, should you stop maintaining your fitness? Whether career, paid-on-call, or volunteer many firefighters are overweight or out of shape and never plan on doing anything about it. Since I was put on my department's recruit committee, I have started putting together proposal to improve the CPAT that applicants go through and how to improve the overall department's level of fitness. Remember, the adrenaline is kicking when you roll up on a residential structure fire at 2 AM. What about during overhaul and breakdown? That's just as important as the initial attack and requires more endurance and a higher level of fitness to safely complete those tasks.